Today the US SEC announced that it halted a proposed ICO and froze it’s assets. The proposed PlexCoin ICO had raised $15 million since its launch in August. The SEC was correctly alarmed by promises that PlexCorps made regarding a 13x profit in 30 days. 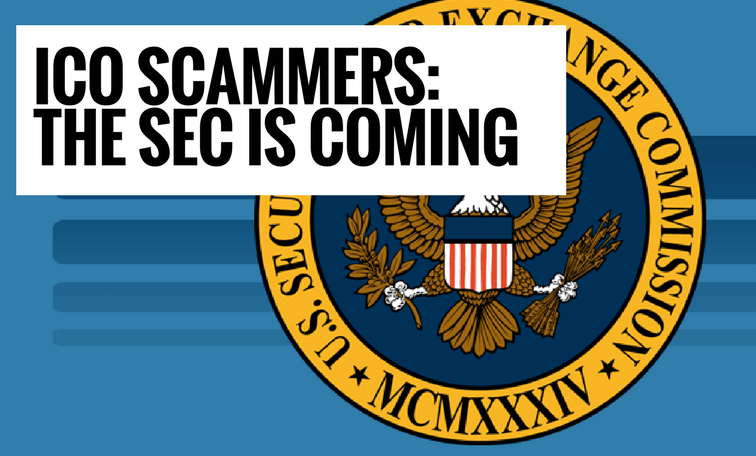 ICO scammers take note – the SEC is onto and is coming for your ill-gotten gains. Remember, back in August, the SEC’s Office of Investor Education and Advocacy issued an Investor Alert warning investors about scams of companies claiming to be engaging in initial coin offerings. You can read the full Press Release on the SEC website. The Securities and Exchange Commission today announced it obtained an emergency asset freeze to halt a fast-moving Initial Coin Offering (ICO) fraud that raised up to $15 million from thousands of investors since August by falsely promising a 13-fold profit in less than a month. The SEC filed charges against a recidivist Quebec securities law violator, Dominic Lacroix, and his company, PlexCorps. The Commission’s complaint, filed in federal court in Brooklyn, New York, alleges that Lacroix and PlexCorps marketed and sold securities called PlexCoin on the internet to investors in the U.S. and elsewhere, claiming that investments in PlexCoin would yield a 1,354 percent profit in less than 29 days. The SEC also charged Lacroix’s partner, Sabrina Paradis-Royer, in connection with the scheme. Today’s charges are the first filed by the SEC’s new Cyber Unit. The unit was created in September to focus the Enforcement Division’s cyber-related expertise on misconduct involving distributed ledger technology and initial coin offerings, the spread of false information through electronic and social media, hacking and threats to trading platforms. Based on its filing, the SEC obtained an emergency court order to freeze the assets of PlexCorps, Lacroix, and Paradis-Royer. The SEC’s complaint charges Lacroix, Paradis-Royer and PlexCorps with violating the anti-fraud provisions, and Lacroix and PlexCorps with violating the registration provision, of the U.S. federal securities laws. The complaint seeks permanent injunctions, disgorgement plus interest and penalties. For Lacroix, the SEC also seeks an officer-and-director bar and a bar from offering digital securities against Lacroix and Paradis-Royer. The Commission’s investigation was conducted by Daphna A. Waxman, David H. Tutor, and Jorge G. Tenreiro of the New York Regional Office and the Cyber Unit, with assistance from the agency’s Office of International Affairs. The case is being supervised by Valerie A. Szczepanik and Mr. Cohen. The Commission appreciates the assistance of Quebec’s Autorité Des Marchés Financiers. As we reported back in August, Floyd Mayweather is fast becoming the (well paid, we assume) voice of ICOs. Hot on the heels of his Stox and Hubii promotions, Floyd is now endorsing the Centra ICO. On a side note: this comes just days after the FTC apparently sent warning letters to Instagram influencers reminding them to disclose business relationships for products they promote. We have no idea to be honest. Looking at their site they are apparently “a Crypto debit card for Bitcoin, Ethereum & more.” Their Debit Card “enables users to spend their cryptocurrency in real time with a 0% exchange, spend, & withdraw fees”. Is there an ICO that Floyd Mayweather doesn’t promote? It’s been busy for nationally-sponsored cryptocurrencies. Earlier in the week we saw the news that Estonia is considering holding it’s own Initial Coin Offering and launching a digital currency called “Estcoins”. According to First Deputy Prime Minister Igor Shuvalov, Russia is planning its own digital currency on the blockchain platform. Shuvalov noted that Russia “is actively working at the international level and wants to ensure that security issues are solved from the very beginning,” and that digital currencies should no longer be “locked in a chest and hidden”. It seems that Russia just can’t get enough of crypto. Remember that Burger King’s Russian division just announced it’s “Whoppercoin”, a digital token that local customers can earn on a special digital wallet after buying BK’s signature Whopper burger. Do you want “Crypto” with that? What Is It With Floyd Mayweather and ICO’s? It seems like Floyd Mayweather just can’t get enough of ICO’s. His latest Facebook post sees him promoting the Hubii Network. It seems like only yesterday that he was all-in on the Stox ICO. Oh how time flies. “Money” Mayweather is securing his place as one of earliest adopting sports stars. Does he see a future for himself outside the ring in the Ethereum or Smart Contract space? Or is it all about the short-term money?